This set of seed pearl jewelry from the 1830s is referred to as a parure, essentially a matching suite of jewelry comprising interchangle pieces that expand the wearability of the set. A parure has three or more pieces: typically, a necklace, at least one pair of earrings, a brooch, bracelet, and in larger sets, a ring, a diadem, tiara or an aigrette (feathered hair ornament) or other adornments. Parures were designed to be modular, allowing the jewelry to be combined into new pieces to meet the ever changing demands of fashion. Some necklaces could be worn intact or disassembled into bracelets or pendants, hair ornaments or brooches with cleverly interchangeable components and locking systems. This parure is composed of a necklace, two pairs of earrings, a brooch, two bracelets, and a bodice ornament. Bracelets were often worn in matching pairs – one on each wrist. Bracelets could also be clasped together to form a choker, providing another option for the wearer. The pieces in this suite are made of lustrous tiny seed pearls, but pearls were by no means the only precious material used to create parures. The higher up the social ladder, the more costly and elaborate the jewelry became. Early parures date from the 18th century, and the form gained in popularity during the 19th century. Prior to the mid-1700’s attempts were made to maintain class distinctions in England, and decrees were issued with the intent of regulating what items of clothing and jewelry could be worn based on rank or income. These sumptuary laws were often ignored or flouted during the Georgian era (1714-1830) and eventually disappeared. As a result, jewelry was now more widely available to the middle class. Parures stayed popular well into the reign of Queen Victoria (1837-1901). 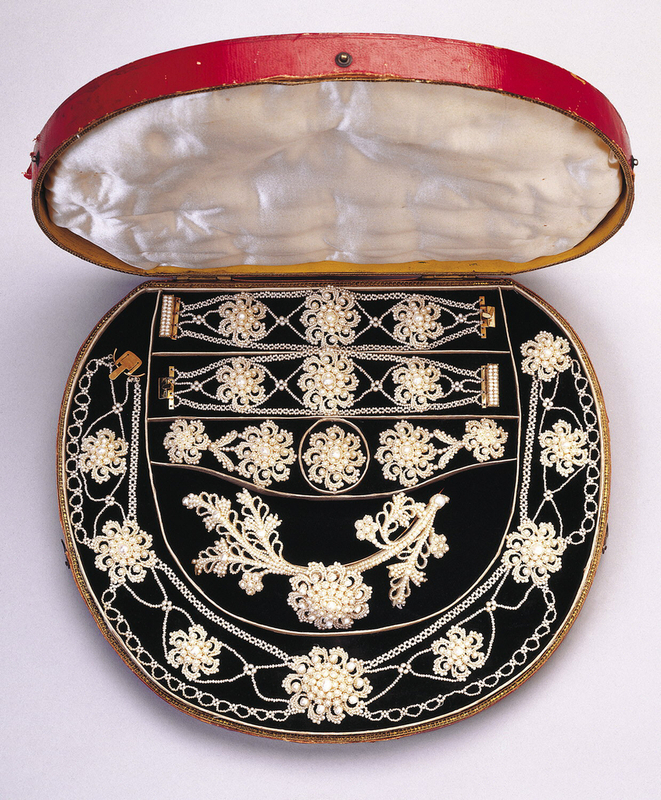 It was during Victoria’s reign that decorative items like jewels and flowers were imbued with sentimental associations. Seed pearls when set with jet became appropriate for mourning jewelry because the minute pearls were reminiscent of tears. Alternately, seed pearls were used in elaborate jewelry designs since they were also considered chaste and elegant. Such parures were deemed appropriate for new brides and young girls being introduced to society. Susan Teichman is a design historian specializing in the history of jewelry and synagogue architecture.